I finished up my first bug scarf in taquete & silk... 20/2 silk warp and 60/2 silk for the tabby and the pattern. There are six different beetles each with their inverse on the back side. The piece has fringe on all four sides and from the photo needs a much better ironing. The drape is not quite like the sample but perhaps it isn't completely dry. The sample seems smoother and silkier. The next one I will do will have a tighter sett. This is at 24epi which is a bit too loose so I will probably try 30 on the next one. From a weaving standpoint, It took a couple of weaving periods for each bug. What is a weaving period? It starts when I am in the mood to weave and continues until the dogs want to go on a walk or I have to un-weave too many rows. Usually it's about 90 minutes to perhaps two hours. I have been having a fun time finishing this tapestry. It is probably the first time I have really have enjoyed the finishing process. I am also excited about the end result. What I am doing here is drying the yellow orange warp in the middle of the photo. I just dyed the white warp that color to match the yellow weft in the piece. I may add a few beads there and that's it. The warps at each end were twined with my handy four clip fringer. Remember that I pulled about 13 yards of warp through the tapestry so was lots remaining on each end. One side I cut off fairly short. The other end...the one wrapped in plastic...is also twined but the ends are not short. The longest end is probably 6 yards long. It took awhile to twine those puppies. I was standing all the way down the hallway. I keep them wrapped up to avoid tangling. It's a great organic piece. I tried hanging it but gravity gives it much too uniform look. It is much more interesting just 'lying' around. I finished my sampling of a 20/2 silk warp in taquete so I can now start weaving. Here is the first beetle. There will be six different beetle species in a mixture of blue, light blue, yellow and orange. The background, beetle and fringe will vary by section. It's a silk bug sampler scarf. Before I started I had asked a number of folks what sett they thought I should use to get a real nice drape for a scarf with 20/2 silk in a summer/winter or taquete technique. I got numbers from 18 to 40 epi. "It depends." When I asked on the weavetech list the recommendation was 2/3rd of a twill set-up. ie. 22-28epi. Since I make less mistakes sleying if I use a multiple of 4 or 2 I decided to go with my 12 dent reed and a 24 sett for my sample. I played around with a variety of 20/2 silk colors for the pattern and tabby weft and didn't really like any of them. My original selection of colors was thrown out quickly. I got out my 60/2 silk which I have never woven with and tried that in combination with 20/2. Then I did some with only 60/2 silk. I took the sample off - threw it in the washing machine and dryer to see how it would wet finish and ironed the puppy. The best feel was the part using 60/2 silk for both the pattern and tabby weft. It was really soft with a lovely drape. So much softer than anything I have woven before. The parts with the 20/2 weft had that heavier stiffer feel which was not what I wanted. The 24epi sett may be a bit too loose I am not quite sure...it does tighen up in the finishing process. I decided to try this set up for one scarf. I have warped enough for two. So now all I have to do is tweak a few beetle patterns from my extensive collection and weave away. I finally found some time to work on pulling my spiral tapestry. And this evening I just finished the pulling. Hard to believe that was 13 yards of material! This piece is going to be exhibited in the Spectrum show at Color Connects - the ASCH fiber conference in Riverside Ca in early March. On the entry form I had to say how big it was. Since I really had no idea of how big it would be I indicated it was smaller than a bread box. It sure would fit in my bread box...at least in this configuration. It's now resting. Tomorrow I will play with it a bit...then...snipping, sewing, ironing, weaving the ends and figuring out the best way to display. What fun! Here's a little something I just finished. This is a tapestry I did way back in 2006 for the ATA Small Format exhibit. The Seaside Tapestry Group did a group contribution to the exhibit called Vintage TVs. If I recall, each of our pieces had to be 4 inches by 6 inches and include some gray values. My piece was Mr. Clean - the man of the kitchen in the 1950's and 1960's. He's got the huge biceps and the small earring. And there he is winking at you. The cabinet doors can be open all the way, part of the way or be closed. 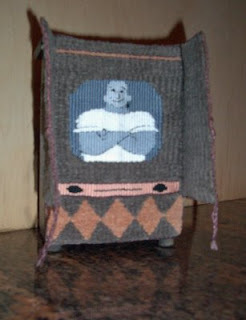 The television portion was woven in embroidery thread. The rest was in chenille. I finally decided how to mount the piece. It has come off my bulletin board and moved onto its own wooden TV cabinet. The newly constructed TV cabinet has the cutest little feet. Mr. Clean can stand on its own or be hung on the wall. I think it is the perfect way to exhibit this piece. I am going through all my older pieces and making sure they are mounted the best they can be. Another filler project...as if I need more projects!